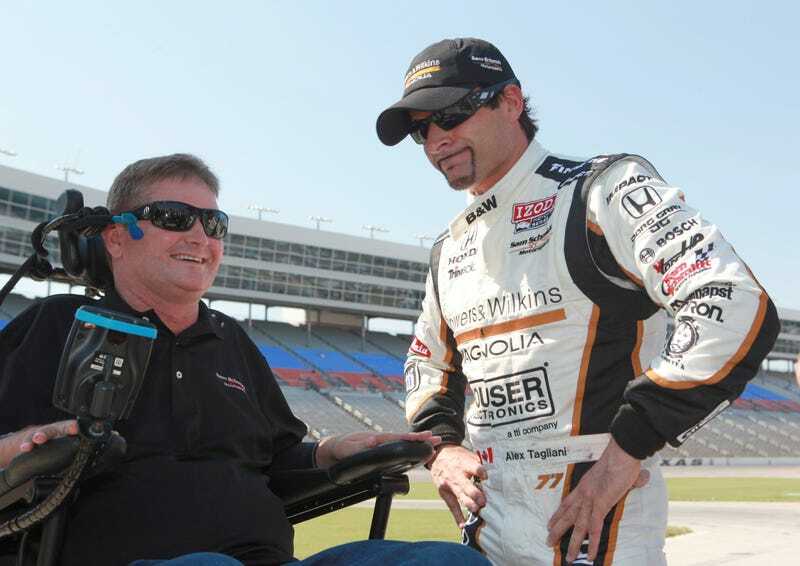 Verizon IndyCar Series team owner and former Indy Racing League driver Sam Schmidt, paralyzed from the neck down in a test crash in 2000, will reportedly receive a license next week to drive a street car with his head. Schmidt will use head movements, breathing and voice commands to control the car. Schmidt, the owner of Schmidt Peterson Motorsports, will receive the license from the Nevada Department of Motor Vehicles on Wednesday, according to a report by the Las Vegas Review-Journal. The Journal reports that the car piloted by Schmidt will be a 2014 Chevrolet Corvette Stingray modified by the company Arrow Electronics, with modifications that allow him to control the car as a diagnosed quadriplegic. According to the Journal, the controls allow Schmidt to exhale into a tube in order to accelerate and inhale for braking. In addition, four infrared cameras within the car track Schmidt’s head movements for the purposes of steering. Schmidt has demonstrated the Stingray’s abilities at events like the Indianapolis 500 over the past few years, and the Journal reports that he’s been working with the DMV for about a year on getting a driver’s license. While reports from the Journal and NBC Sports dub the license as the “first license for a semi-autonomous car,” the original report did not say whether or not the car has semi-autonomous capabilities to act as an assistance system without input from Schmidt. Plus, there are semi-autonomous cars out there already that don’t require licenses to drive—just look at Tesla and Mercedes. Semi-autonomous or not, it would be a big feat for transportation departments to be able to accommodate a person driving a car with only movements of his or her head. With the impending onset of fully autonomous cars onto the market, this kind of flexibility could be a good sign. This article has been updated to identity Schmidt’s car as a 2014 Corvette Stingray, as the car is incorrectly identified as a Z06 in the original Review-Journal article.